Thirteen-year-old Ayrion spent his entire life training to become an Upakan warrior, the youngest ever to claim the title. With determination, hard work and his secret gift of magic, he excelled in his tests and proved himself worthy when he joined his father in a mission and returned successfully. However, Brim, the head of the clan, and his 17-year-old son, Flon, often treated Ayrion and his family unfairly. When Ayrion accidentally caused a death that he didn’t see coming, his banishment to the outside world will test all his years of training and wise guidance from his father, as he heads to the city of Aramoor. Banished (Street Rats of Aramoor, Book One) by Michael Wisehart starts in the Lost City. The world building is fascinating and well structured. The Upaka is an interesting community. As they spent so much time underground, they can see in lower light but have to cover their eyes with shaders, their version of sunglasses, when they do go above. They are mercenaries－their fighting ability is their greatest asset. Overall, the plot pace is moderate but well thought out with plenty of action. The story is both plot and character-driven, giving it a good depth. The characters are a diverse and interesting bunch of individuals with their own eccentricities, particularly the infamous Captain Treygan and his crew. His time as one of the Wind Binder’s crew is the highlight of the story for me. Ayrion’s character development is deftly done, and the narrative is vivid and brings the story to life nicely. There are enough great messages here for teen boys in term of ethics and principles, good traits and strength of character that they can emulate. Banished is not just a YA fantasy adventure, it’s also a good coming-of-age story for its intended readers, a great start for the series from Wisehart. 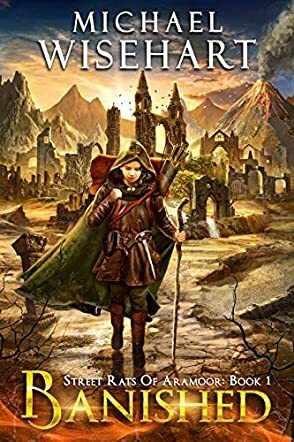 I truly enjoyed it and the sneak peek of Book Two will definitely make readers look forward to joining Ayrion on his journey once more.